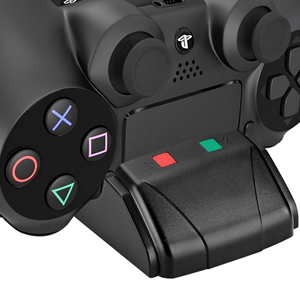 【Dual PS4 Controller Charger】- Support charging two PS4/PS4 SLIM/PS4 Pro wireless controllers and securely store simultaneously, save time and make the most of your PlayStation 4 Video Games thanks to this ps4 accessory. 【LED Light Indicator】- The dualshock4 charger dock features a practical LED indicator, RED means your controllers are being charged while GREEN means you are ready to play until you drop! That will allow you to check the charging status at a glance. 【Compact And Lightweight Design】- This charging station features a compact lightweight, sleek and smooth touching, easily portable design allows you to carry it anywhere you go! The 150 x 55 x 35 mm size and the 53g weight provide you with countless possibilities. 【Powered by USB Adapter Ports】- Comes with a USB charging cable, simply plug into your PS4 console, PC host and any other standard DC 5V adapter. provides an easy and quick way to charge and store your controllers. Ideal for saving your place to store your controllers in the charger when you’re not playing. 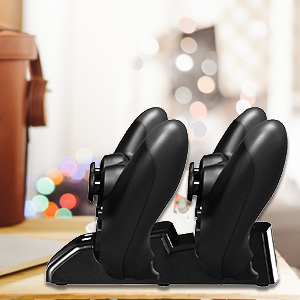 【Anti-Skid Function】- 4 anti-skid glues guarantee the stable balance, prevent the charging dock from wrong shifting. Made of durable ABS Material that can assure unmatched longevity. You will get 4 white and 4 black useful bonus thumb grips for controller joysticks. It’s really an ideal gift for video gamers. PECHAM WARRANTY: 12 MONTY WARRANTY & 100% SATISFACTION GUARANTEE. Playing games on the PlayStation 4 is very enjoyable, relaxing and an all favorite pastime! However, quitting a game due to the fact that the controllers are out of battery is very irritating. If you have been looking for an easy way to keep your controllers fully charged and enjoy your time with your friends to the fullest, you have come to the right place! Get ready to save time and make the most of your PlayStation 4 gaming thanks to PECHAM ultimate controller charging station! This dual shock controller charger will charge 2 ps4 controllers simultaneously, saving you time! The led indicator will help you check on the charging status easily! The attention grabbing design is bound to impress everyone, adding a modern, elegant touch to your play room or your entertainment center. The compact, lightweight design allows you to take your charging dock with you anywhere you go! No need to wait anymore! Just grab your controllers and have fun with your friends! This ps4 dualshock charging station features a practical led indicator that will allow you to check the charging status at a glance! Red means your controllers are being charged while green means you are ready to play until you drop! Forget about cheaply made charging docks that have you guessing whether your controllers are charged or not! Whether you want to use it at home or at an entertainment center, this dualshock charger is the perfect choice for you! Copyright © 2018 STANBOW All Rights Reserved.